First of all, we apologize for taking so long to write a post, but life got really busy. We moved to a different apartment, Carol started a new job full time and she is starting MBA soon. Rich besides the move, he was having perhaps a mid life crisis (LOL), but you can check his blog for more info. Produce: Cauliflower; Carrots; Kale; Spinach; Eggplant; Onions; Garlic; avocados; zucchini; squash; Red peppers- we get the produce from a small farmers market on Lake worth road called Sofia Farmers Market. Protein: Grass fed ground beef, sirloin grass fed steak; organic free range chicken from trader joes, pasture raised eggs and pasture raised ghee from fresh market, Pederson Farm bacon (the only one without sugar), only Whole Foods have it. Coconut products and etc: Sambazon acai sugar free, Native Forest coconut milk (unsweetened), Native Forest coconut cream (Rich is addicted), raw artisana coconut butter (Carols Addiction), Nativas Naturals Maca powder and 365 organic coconut oil, this we only find at Whole foods. Using fat as fuel: vespa CV 25 (Rich) and Vespa Jr (Carol)- You can get here. – Water and about 4 tablets of Nuun. Of course we can’t leave out the occasionally Vega Maca Chocolate bars (check video below). That is pretty much what we eat, its very simple and very effective. FAT IS YOUR FUEL!!! We understand that food is some sort of an emotional thing for a lot of people, and it was for a long time for us too. After learning about so many approaches (and experiencing their pitfalls), we learned that there is nothing better than moderation, and specially wholefoods!!! You can eat pretty much everything, if you don’t overdo, but of course, the cleaner you eat, the cleaner your body (mind and soul as well) will be and will thank you in the future. 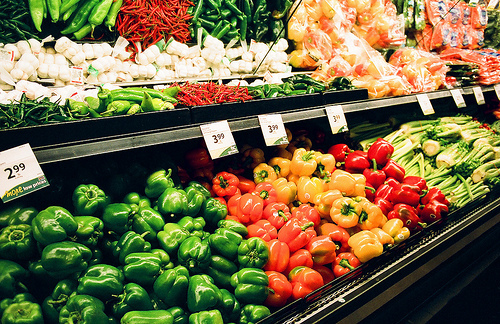 We see our food choices as our “health insurance”, we will explain more later. 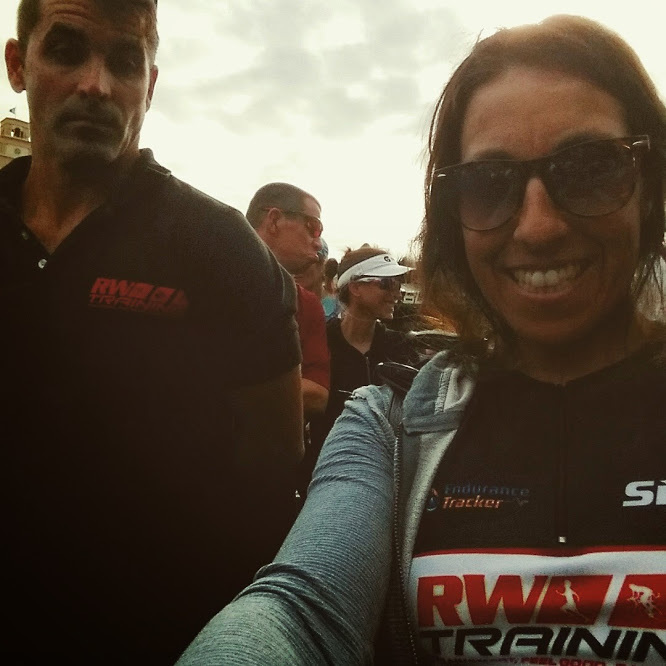 So Carol registered for Ironman Florida that will happen November 2015, but in preparation for that race Richard (also her coach), had planned for her a few half ironman distances, and the first one was last weekend, in Naples. Believe us, as a husband and as a coach Richard had/have big plans for Carol that he has been putting it off for all these years, and he is finally in heaven (or maybe not so much because coaching his wife is also the hardest thing ever), to be able to guide Carol through this journey that he knows so well. What Carol wasn’t expecting for this first race was that Richard was going to be racing the same race, but double the distance. At first, when Rich brought the idea, Carol kind of freaked out, because she is used to watch Richard on his races, follow every step possible, and be there physically or in front of the computer from beginning until the end. 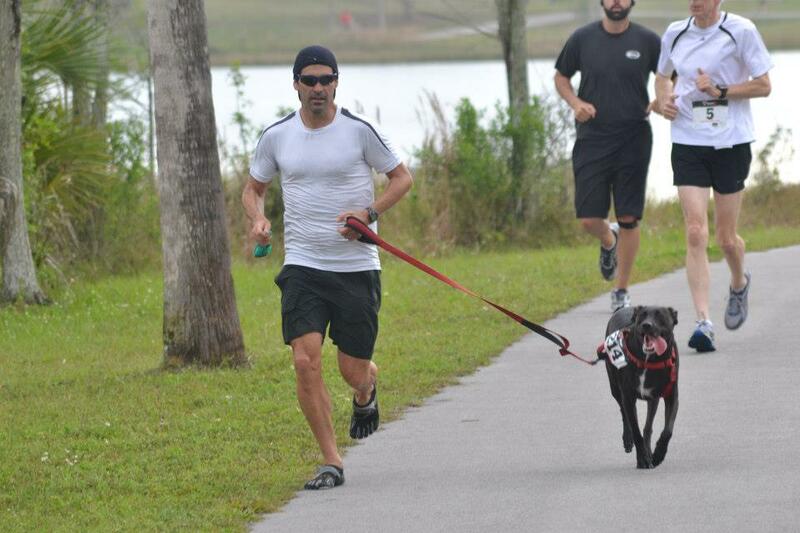 But this one, she was going to be racing half of the time, and then…who knows…recovering from her first race. Plus…she wouldn’t have Rich’s support in her first long distance race…”he will be there…but mentally focus on his performance”, she thought!! Well, when our entry was confirmed for Full Distance (Rich) and half distance (Carol), besides the butterflies in the stomach, we got really excited! We thought it would be a great opportunity for both of us to race together (for the first time), and still, Carol could watch part of Rich’s race, as well as, we would be tapering at the same time, watching every step before the big day, etc etc. The result? We had a blast!!!!! A few days before the race, we thought we had the training in place, and our main focus was the nutrition!! Very important!! As a copy cat as Carol is, she would eat (or not eat) everything Rich would (or would not). Having had a few stomach issues 2 weeks prior to the race, Carol knew she had to score the nutrition in order to have a good race. 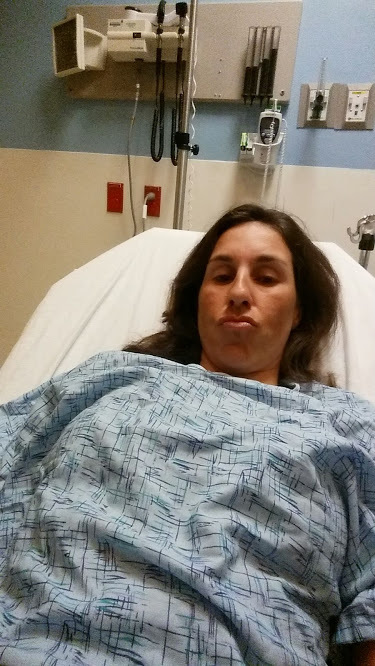 Carol’s hospital visit 2 weeks before the race…still didn’t stop us!! It was a great experience picking up packages together, preparing the bikes, setting goals, going over race strategy (It was just Carol’s first long race, but she had to have a strategy…lol…women always want everything to be organized and in place, even when they are having fun)!!! And we even had a good time trying to calm each other nerves!! For Carol was just her first, so, even though she always want everything to be perfect, she was cool about her race, and she kept telling herself she was there to have fun. 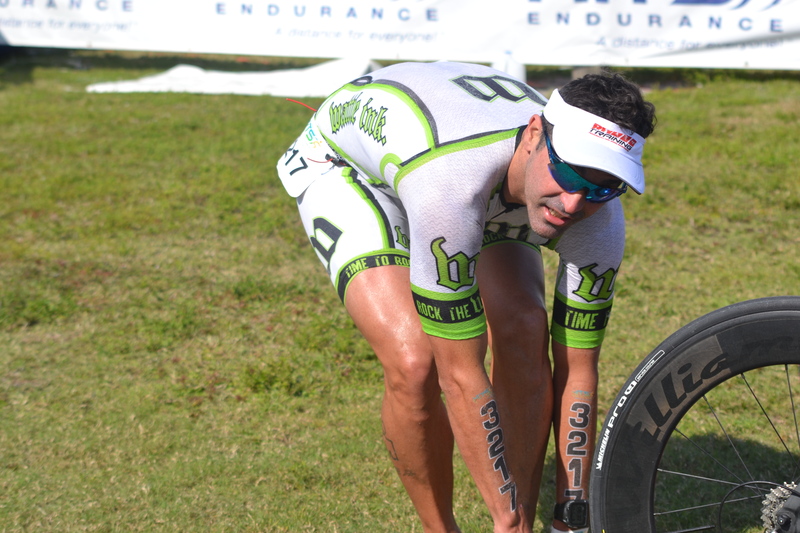 But, for Rich, was time for a PR, for a great race and maybe time to win an Ironman?? So, having to go over details with Carol kind of made Rich to distract his mind and relax a little!!! The day before…who is happy, who is nervous? Race day was here, and we warmed up together, and we waited for the start right next to each other…when we knew was the last moment close to each until Rich’s finish. We raced like we never done before, knowing that we would see each other at some point at the race. Carol finished her race, and quickly changed from her athlete outfit to her “wife outfit”, with her camera ready to go and her lungs ready to scream for Rich. At some point, Carol found out something happened with Richs wheel, and even sore and tired she went back and forth to find out what his status was. She came to find out, Rich had to stop for 43 minutes on the bike for mechanical issues, but soon she saw him in the transition. 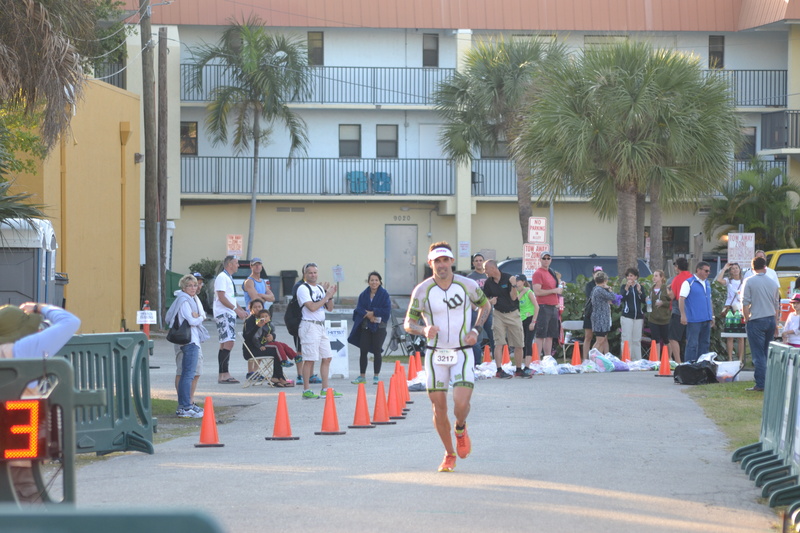 In Transition she looked at him and said, you still can win this, and hey…I did a great race! She told him her time and he was impressed, probably thinking, “I have to make this a big day for both of us”!!! So he started his journey on the marathon, reaching the second position within the first half. Carol gave him his special needs on the half marathon, and then decided to get her bike out of transition and go out on the course. There she was, sore and tired, checking her bike out of transition for 13 extra miles cheering Rich, timing him and taking pictures. For Carol, racing her first long race was exciting, but nothing beats cheering her hubby succeeding after so much effort and dedication!! Rich listening to Carol on transition…getting ready to rock the marathon!! 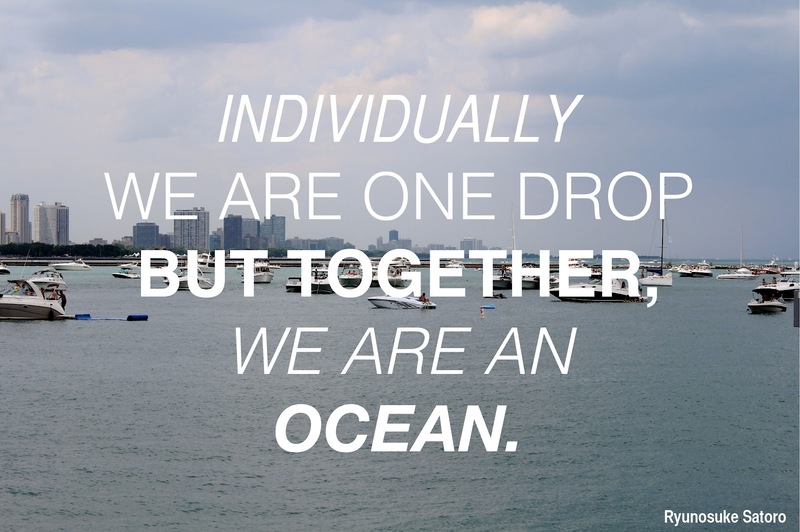 Overall, racing together made us stronger and even more connected. 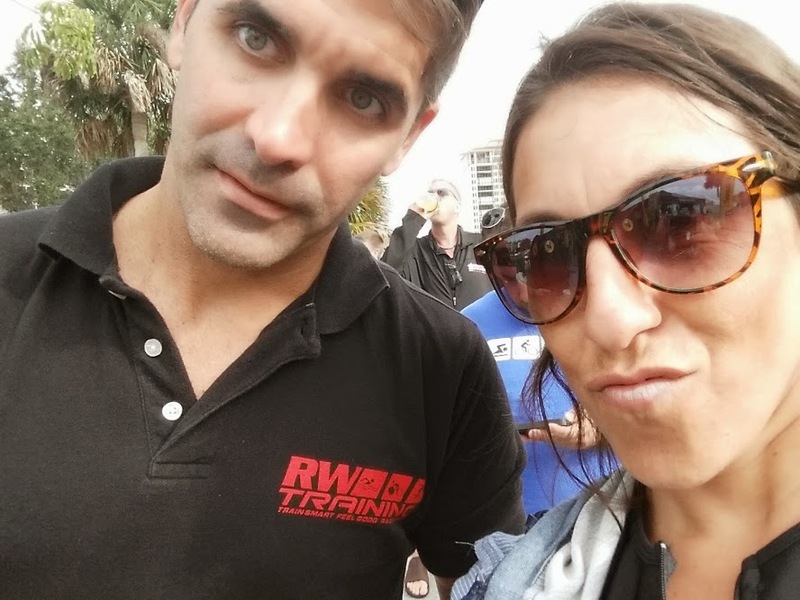 Rich could pass on his experience as coach and athlete, and Carol, as relaxed as she was, could bring Rich a little more peace for before and during the race…telling him that everything was under control! 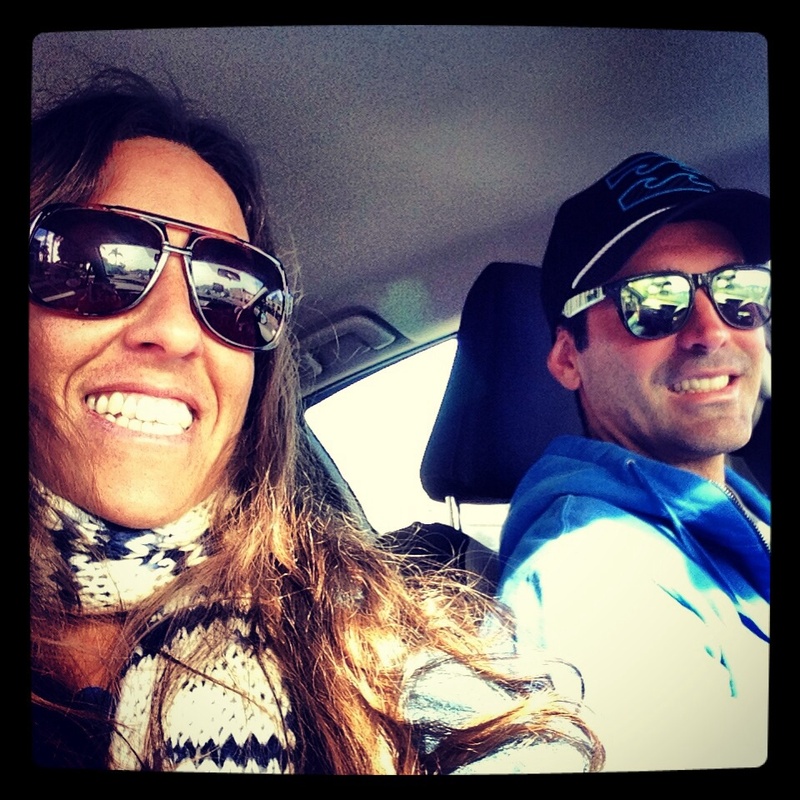 Our first triathlon together was a great experience…HAPPY!!! We have totally different approaches in sport, or we used to have…but today we feel even more connected due to the fact that we love the extra miles, we learn with the challenges, and every step we make, every fear we overcome, make us stronger as people and as a couple. We chose challenging goals over comfort, and as long as we live, we will work hard every day to reach those dreams, one by one!!! Back home, happy family, proud of our achievements!! We created this blog together, but today Carol will be speaking from her perspective. 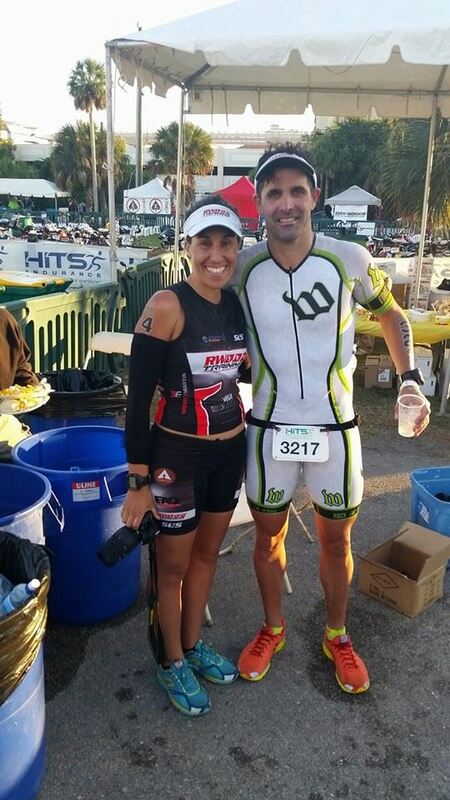 Support is a big element to the “Endurance Couple” equation, and we couldn’t pass this subject without mentioning a few of our experiences. Well, let’s talk about support. How can I start? I can say that I have been blessed having the most supportive family, and now the most supportive husband. When I was young, my father was transferred to another city, and my mom, my brothers and I all moved to this small city in the suburban of South of Brasil. I was 9 years old, and definitely was not happy with this change. I had my best friends in the city that I was born, my neighbors, and now, we moved and I didn’t know anyone besides my brothers and my parents. Well, this was really, really, the best thing that could ever happened to our family, and the reason why is that at the same time we didn’t have anyone, we had each other, and that became more than ENOUGH. We became the closest family around, we were always together, my brothers and I learned how to play and have fun with each other, and we were always there for each other. Of course with time we got to know people, but that period of having/knowing your family only created a huge base we carry up until today. Richard will later tell a little bit about his perspective in support, but first I want to share Rich&Carol connection. We met 9 years ago, and as we mentioned before, from day one we were really in love. When we met, I was studying for BAR (OAB) exam, and Richard was going to school for Exercise Science and training, and… did I mention we lived 15hrs driving away from each other? Yes, that’s right. We would see each other every two months, and every “good-bye” was truly hard. Every little money we made we bought tickets to see each other, it was crazy…specially being so in love and making plans to get married, be together forever. So, going through the BAR exam was one of the hardest things I’ve done, and Rich was there for me, from the beginning to the end, to celebration time (yay, I passed!). And, training and trying to become a professional athlete in Brasil wasn’t exactly easy, was tough, but Rich never gave up. Well, Rich never giving up is almost an understatement, since every person that knows him, knows how hard he tries something and sticks with his guts when he really wants it. He has thought me so many lessons that I could write a book about them, but the point is, besides Rich being an inspiration to me and so many people, the support both of us had, made us believe that we could and would reach ANYTHING. Having that base, when we became a couple, support was always there for each other. We never gave up on each other, even with the distance, and the difficulties, we always supported the idea of being together and “winning” together. It didn’t matter how crazy, big or impossible a dream or a plan seemed, Rich would always say “It sounds like a great idea…lol”. We worked together, we made it happened. Our backgrounds are totally opposites, but our souls and essences match pretty perfectly and we have been achieving goals and living dreams since we met. Sometimes, people will not understand your purpose, or even judge your actions…do not pay attention to those people, and don’t judge them either. The support that we are talking about comes from within, comes from a base you have in your childhood, comes from your Mom telling you “Mommy will be always here for you”, comes from your friend or sibling saying “don’t worry, I’ve got your back”, and specially comes from your partner being by your side, every day, every sunny or rainy day, every happy or not so excited day, and pushing you forward. Some people have had that support, I would even say most of the people I know, but some people just don’t pay attention to it. Any kind of support is “a support”, and most of the times people don’t even realize the difference they are making on each others lives. 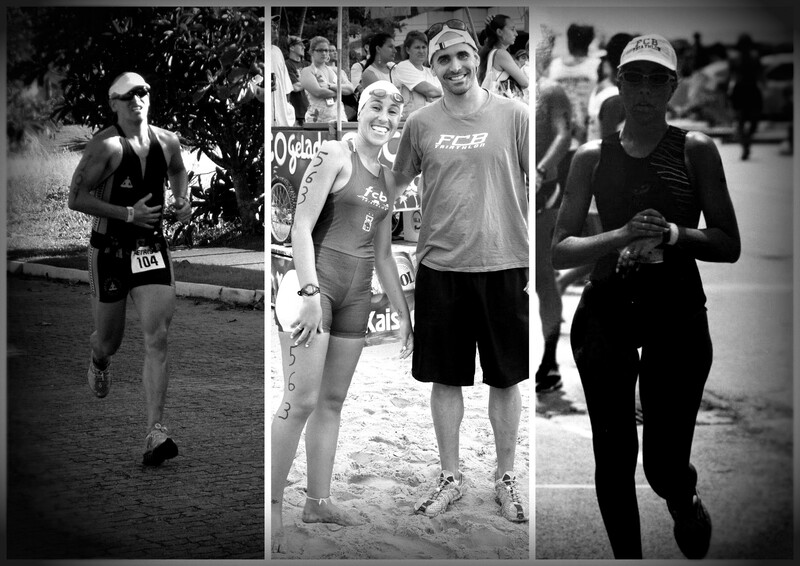 When I went to Richs second ironman, I felt like the proudest girlfriend in the world!! He didn’t even do closed to the performance he wanted to, but I didn’t care, I was proud to see what he went through to get to that race, and didn’t give up. He was, is, and he will always be my hero!! Up until today, he overwhelms me with emotions when I watch him racing, or coaching people. I am the proudest wife, it may sound corny, but I AM THE PROUDEST WIFE!!! Rich makes me proud every day, and I am pretty sure this is all it matters in life. The lessons I learn, the support I have, and all the love there is around us!!! Next, Rich will speak a little bit from his perspective on support, but keep in mind he is the most supportive human being I ever met. To be a coach you really have to understand people, and accommodate their needs, and facts. Rich does it all, and although I am also his athlete, in our married life he also goes above and beyond. Every day I try my best to transmit him all the love and support I receive, always remembering how I got where I am now (My family, friends, all the people that supported us from day one when we made this HUGE move from Brasil to USA, and then, to Wellington). Wowwww…I will be forever grateful, and believe me, every support you provide to one another, can seem pointless to you, however it can literally chance people’s life! Well, before we start sharing some interesting stories, we thought we should quickly introduce ourselves first. Started in sports: Carol- started swimming when I was 9 years old. Rich: Basketball with 11 years of age. Why triathlon? Carol: Because I was a horrible swimmer, and specially because I wanted to follow my brother’s path. Rich: Because I was overweight, and decided to change my life!! Wowww!!! Special moment in sports: Carol: When my brother Fred and I won an entire aquathlon championship, and we were offered a sponsorship. Richard: When I won my first triathlon overall. Dream: Carol -I live the dream, but I could have a few (lot) more things…haha. Rich: To win an Ironman. There you have it, a few facts about us, and below a picture of races we have done long long time ago. 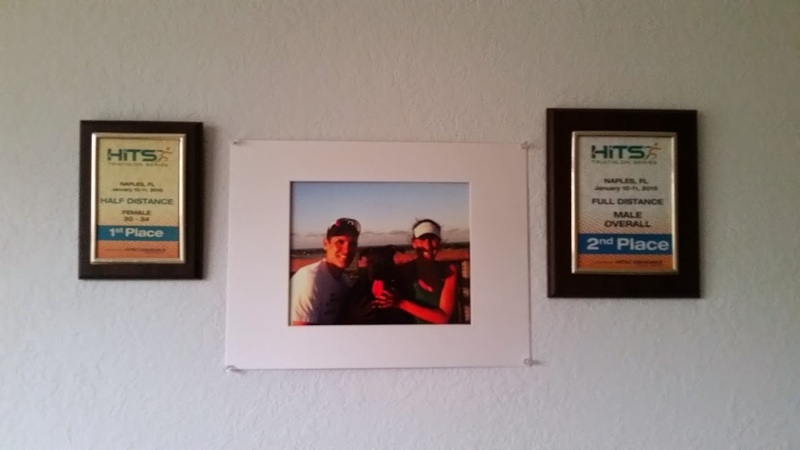 Its hard to tell exactly when the races happened, but Rich’s picture is probably from 2006, the middle one is from the first race Rich saw Carol participating (2007 ish), and Carol’s picture should be from around 1998-1999. Hello There!!! We are Rich and Carol, husband and wife, best friends, partners, and we are also athletes since pretty young age, having sport playing a big role in our lives! 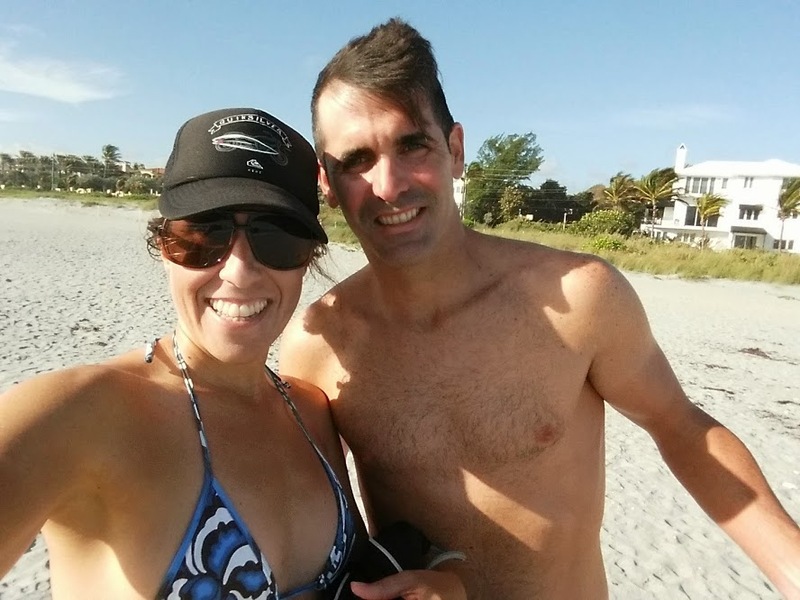 We chose the title “Endurance Couple” because together, and individually, we both had gone through life changing experiences, and besides Rich’s journey as a coach and professional athlete, we also want to share Carol’s odyssey to her first Ironman race. We are here to share, but also to inspire men and women, boys and girls, siblings and specially couples to have sports part of their lives! Welcome aboard!!! !